The AXIS 233D is designed for use in challenging surveillance applications - such as airports, stadiums, casinos and ports - where the ability to follow moving objects from a long distance and see great detail is crucial. 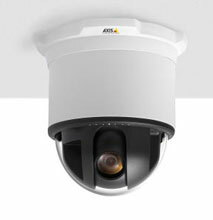 With the powerful 35x optical and 12x digital zoom, AXIS 233D can zoom in on small and distant objects, allowing for example license plates to be clearly identified from a distance of 160 m (525 ft). Whether zoomed out or in full 35x zoom position, images are crisp, clear, and rich in color and detail.